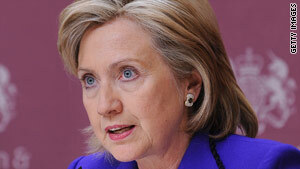 Secretary of State Hillary Clinton says Iran should face consequences for its "defiance of international obligations." London, England (CNN) -- The United States is pushing world powers to consider a tough new round of sanctions against Iran for its continued global defiance over its nuclear program. On the sideline of meetings in London on Yemen and Afghanistan, Secretary of State Hillary Clinton is making the case for the sanctions in talks with foreign ministers of Britain, France, Germany, Russia, China, Italy, Indonesia, Saudi Arabia, Turkey and the United Arab Emirates, aides said. "We believe that there is a growing understanding in the international community that Iran should face consequences for its defiance of international obligations," Clinton told reporters after the talks on Yemen. The push for new sanctions comes as Iran continues to hold out on a United Nations-backed deal on its nuclear program. The country had until the end of 2009 to accept the deal offered by the "P5 plus one," which consists of permanent U.N. Security Council members Britain, China, France, Russia and the United States, plus Germany. Instead, Iran countered, giving the West until the end of January to accept its own proposal. Clinton called Iran's refusal to accept the proposal a "turning point" in world opinion. She suggested that even Russia, which has been reluctant in the past to impose new sanctions on Iran, has expressed a new willingness to put additional pressure on Tehran. U.S. and European diplomats said they could begin discussing the outlines of a new resolution at the U.N. Security Council slapping sanctions against Iran. The measures are expected to target elements of the Iranian Revolutionary Guard Corps and would broaden existing penalties as well as impose new ones. Undersecretary of the Treasury Stuart Levy, who designed a tough program of U.S. financial sanctions on Iran, also is attending Clinton's meetings with her counterparts. The U.S. hopes the European Union and other countries will impose tough unilateral sanctions against Iran to complement any measures taken at the United Nations. The officials spoke on the condition of anonymity because discussions about the sanctions are still ongoing. China has emerged as the main spoiler in the effort to impose new sanctions against Iran. Beijing refused to send a high-level delegate to talks earlier this month on Iran, suggesting it did not support new measures. Clinton and her aides, however, said they were optimistic that China would come around. "It takes a lot of patience and it takes a lot of information sharing, and I think that's what's going on now," Clinton said told reporters. "The P-5-plus-one have been unified up until now with respect to every action we've taken. And I am working toward a point where we will continue to be unified and send a very strong message to the Iranians."